BEWARE OF FAKE DBS SMS. "MAKE U MILLIONAIRES"
Scam SMS, an SMS that claims its from DBS was received by our netizen this afternoon. 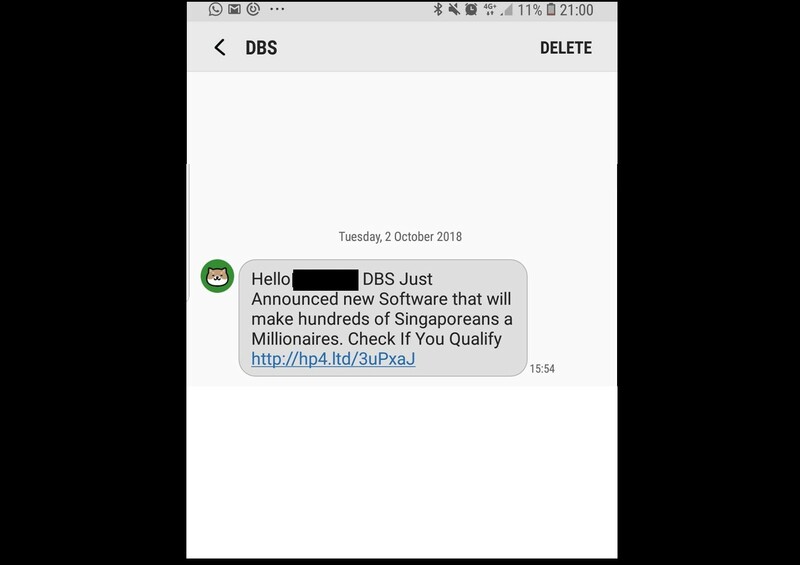 The SMS stated Hello XXXX XXXXXX with the actual name of the person and claim that DBS has a software that will make Singaporean’s millionaires. The link typically leads to phishing sites. Beware and do not click on the link, do not input any information into the website. Please share and inform family and friends. Sharing this information could potentially stop the scam. Previous ArticleSINGAPORE AIRLINES SERVICE FAIL? NO SOLUTION GIVEN. Next Article NEW DON DON DONKI OUTLETS OPENING IN CITY SQUARE! !